On the 100th year anniversary of the tragic sinking of the SS Mendi, the Nelson Mandela Metropolitan Art Museum will open an exhibition of over 200 sketches culminating in an oil triptych produced by local Eastern Cape artist Hillary Graham. 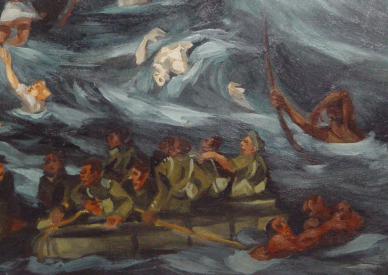 This remarkable work reimagines the tragic event in vast series of tableaus depicting the brave men of 5th Battalion the South African Native Labour Corps who died in this nautical disaster. This installation of paintings and drawings forms part of the Art Museum's Permanent Collection. The exhibition opening will be held on the 21 February 2017 and other public events have also been arranged, for more details, see under events.